Characteristics: additional card draws, play for free / report for free. Requires: Espionage, Espionage - Bajoran, affiliation, Bajor region, Resistance. Limited to Resistance personnel and to unsolved missions. Game text before errata: "Seeds or plays on table. Once each turn, your Resistance personnel may report for free to your facility or ship or to any planet. Also, your Bajoran espionage cards may not be nullified. 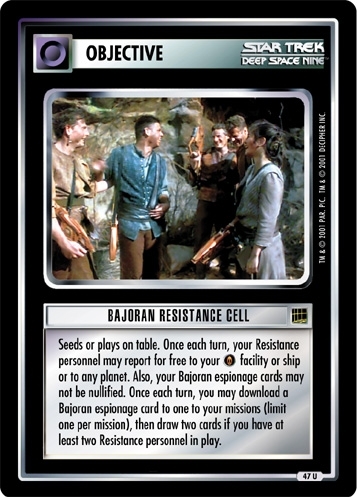 Once each turn, you may download a Bajoran espionage card to one to your missions (limit one per mission), then draw two cards if you have at least two Resistance personnel in play." Bajoran Resistance Cell has long been criticized for its power, with draws, free reports, and the ability to report almost anywhere. It was a huge tool for the Bajorans, but also one that could be splashed into decks for several other affiliations, either with or without a treaty. It made it hard for Design to give new things ... and when they did, they had to be specifically written to not stack with BRC. We've made just a small change here, to restrict the reports to the Bajor Region. No Delta Quadrant, no Time Locations. Those Resistance fighters are all over their home system, but not the galaxy. Game text before this errata: "Seeds or plays on table. Once each turn, your Affiliation Bajoran Resistance personnel may report for free to your Affiliation Bajoran facility or shp or to any planet. Also, your Bajoran espionage cards may not be nullified. Once each turn, you may download a Bajoran espionage card to one of your unsolved missions (limit one per mission), then draw two cards if you have at least two Affiliation Bajoran Resistance personnel in play." A Resistance personnel is one with Resistance skill. See Espionage cards. 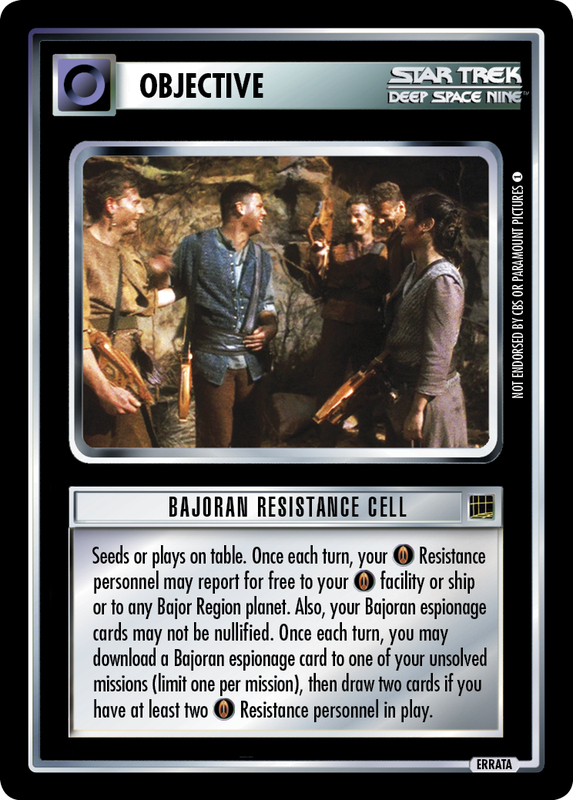 There are 19 entries for Bajoran Resistance Cell (ST1E 14 U 47) at the Tradeplace (43 haves and 7 wants). Click here to see all trade list entries for this Uncommon card!